Krissee D'Aguiar holds a Bachelors of Arts in Psychology from Willamette University. It was during undergraduate she first became introduced to yoga and has been practicing since 2000. After graduating she traveled and lived in South America, returning with an appreciation for the US, and a husband. She spent most of her adult life climbing the IT corporate ladder, but in 2011 left to be a full time mom and yoga teacher. Krissee completed 200hr teacher training at East Meets West Yoga Center in 2012 and is currently working towards a Master of Science in Oriental Medicine and Acupuncture at South Baylo University, Annandale. 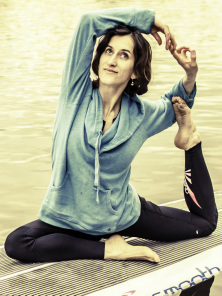 She brings elements of Traditional Chinese Medicine to compliment the therapeutic benefits yoga asana, crafting classes that awaken, stretch and strengthen the body and mind. She always highlights the importance of breath and flow during practice, enjoys contemplating and teaching the Sutras and encouraging other moms to indulge in the joy of yoga.